Festival directors apologize for the “attendance and derogatory messaging” of the National Citizens Alliance. Stephen Garvey, leader of the NCA, during Saturday's parade. Bullhorn in hand, members of the National Citizens Alliance had a message for the Apple Blossom Festival. The far-right nationalist group was a surprising presence amongst the community groups, children and colourful mascots making up the Apple Blossom Festival's Grand Street Parade on Saturday. A minor political party originally formed four years ago by Garvey in Alberta, the NCA preaches a small government, low-taxes and anti-immigration doctrine. Garvey is also known for leading protests as a former associate and spokesperson for the Worldwide Coalition Against Islam, and many of NCA's messages this weekend contained dog-whistle phrases warning against the influences of a “globalist state” turning Canada's identity into a “mongrel” culture. 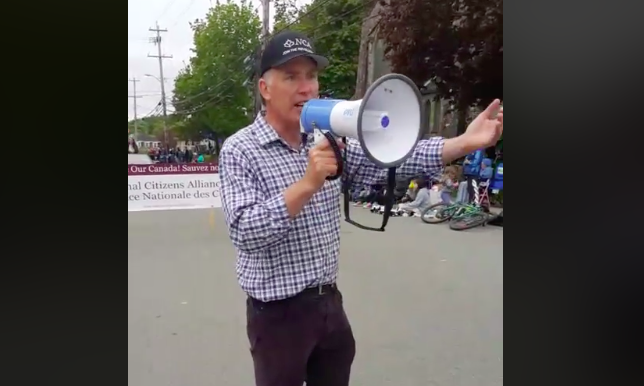 “There's a lot of myths being perpetuated in our society around immigration,” Garvey said at a rally against “socialists and pseudo-Marxists” held Sunday afternoon in Halifax's Victoria Park. The Apple Blossom festival's directors apologized for the NCA's presence in a press release sent out Sunday, and say the organization has been banned from future festivals. The Apple Blossom Festival does permit political parties to enter the annual parade, but entrants must fill out a detailed application and promise not to use the parade as a platform for their political views. “Nowhere on the application of the aforementioned entry did it mention that this entry was representing or aligned with a group with such malicious viewpoints,” says the board of directors. During the rally on Sunday, Garvey took aim at Halifax council's decision this past winter to temporarily remove the statue of racist city founder Edward Cornwallis while a commemorative panel examines the legacy and impact of celebrating a genocidal symbol of colonization. The temporary removal of a bronze statue cast in the image of a man who violated treaties and issued a proclamation for Indigenous scalps was recently condemned in an opinion piece published by the Chronicle Herald for its negative impact on the city's cash-strapped tour guides. When I visited Halifax a few months back I walked 20 minutes by myself just to behold the piece of plywood that remained. I thought it was amazing that the residents rejected the statue. I even took a selfie. ISANS is looking for nominees to profile in a new book on the long-term benefits of immigration.